Grab a coffee, hop in, and turn on the heat. No more struggling with a heavy snow blower. Now you can clear your driveway the easy way. When you want, and how you want. 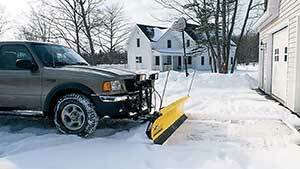 The Homesteader™ Personal Plow is built for today’s light trucks and SUV’s by the experts in snow management for over 60 years. Available in two sizes—6'8" and 7'4". The Homesteader plow complies with Federal Standards and vehicle manufacturers’ weight ratings. Heavy duty elastometer trip springs allow the blade to “trip” forward when it strikes an obstacle, protecting your vehicle and plow from jarring damage. 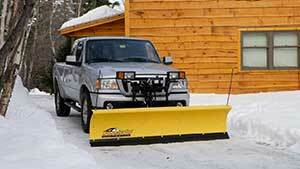 With the convenient hand-held control you can raise, lower and angle the plow from the comfort of your warm vehicle. A compact, dash mounted “joystick” is also available. Exclusive Scrape Lock feature hydraulically locks the blade down for clean scraping action. The receiver brackets on your vehicle are removable, by simply pulling the pins, for optimum ground clearance when you’re not plowing. 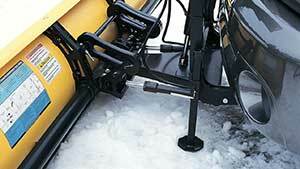 Attaching your Homesteader snowplow is so simple. Either drive into the attachment arms on the plow, or slide the Homesteader into the receiver brackets on your vehicle. Then connect two pins, remove two jacks, and plug in the electrical connectors. Designed to be light weight, yet full strength, the durable 21" tall, corrosion proof, polyethylene blade will not crack and never needs painting. Even sticky, wet snow rolls right off its slick surface. The 45-degree attack angle allows your vehicle to get the work done with ease. Available in 6' 8" and 7' 4" widths. Four vertical ribs and a torsion tube provide structural reinforcement for strength. The formed base angle provides support along the bottom of the plow blade. Fast, responsive hydraulics allow you to change the blade position quickly and easily for efficient plowing. The exclusive scrape lock feature hydraulically locks the plow blade down for cleaner scraping and back dragging performance. 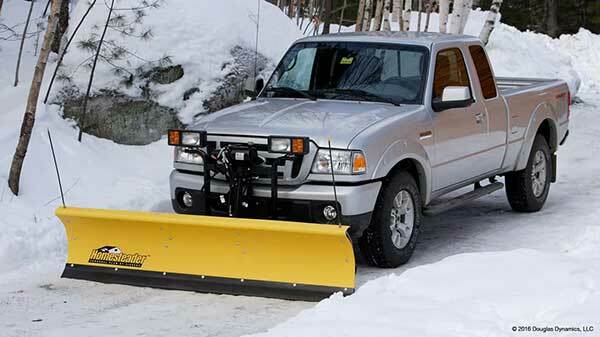 Designed to be lightweight, the Homesteader snowplow features full blade trip. This design incorporates heavy duty elastomeric trip springs allowing the blade to trip forward when encountering hidden obstacles, protecting your snowplow and vehicle from jarring damage.